The addition of accessories to a property can be done in many ways. You could add a shed or other building that is already assembled, or you can always have something built. Many people will have a pergola or even a gazebo built to use when family and friends come to visit. A modern gazebo design can be an ideal option to build as a DIY project. A modern gazebo is a structure that looks quite different than a traditional gazebo. The reason is the materials that are used and the way it is constructed. There is no need for the decking that is common as a design element for most gazebos found on residential properties. A modern gazebo can be built on your property without any type of decking material. If you have a slab or pavers on your property, then covering it with a modern gazebo is an ideal way to make use of the space. All you need to do is decide on what materials you want to use and make sure they are on hand as needed. The material to use depends on the cost and what is available in your local area. You have the option to build a modern gazebo for next to no cost by using small branches or bamboo if you have access to a cheap or free supply. 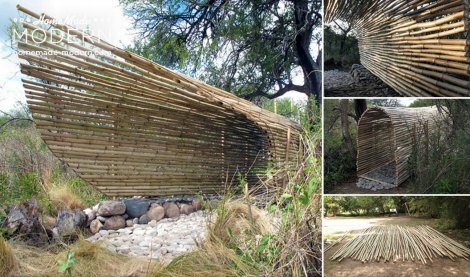 The use of some power tools may be necessary as you are building a basic shelter. You will want to use materials that will not rot when in hot or cold weather. The design to use for a modern gazebo can easily be modified to meet your needs. This means the use of additional materials may be needed if you want to customize the structure.